Wobbe Vegter, who hails from the Netherlands, calls himself a cyberphilatelist as he collects and studies the topic Computers on stamps and postal stationery. Wobbe has been involved in IT since the mid sixties, when he started writing programs (in SPS) on an IBM 1401 computer (its memory: a massive 4K). For the last 30 years he worked as an IT manager for a large retail group in South Africa. He retired in 2006. His exhibit "From Abacus to Internet" describes the history and development of computers, from the earliest counting apparatus, via the large mainframes of the sixties and seventies and the PCs of the eigthies to the internet and the world wide web that makes us citizens of today's global village. “From Abacus to Internet” has been awarded Gold at national exhibitions and Large Vermeil internationally. He is a member of the Bellville Philatelic Society which he serves as its President since 2003, die Afrikaanse Filatelistevereniging, Thematics Southern Africa which he serves as its Vice-President since 2011, the Mathematical Study Unit of the American Topical Association and the Nederlandse Vereniging voor Thematische Filatelie. 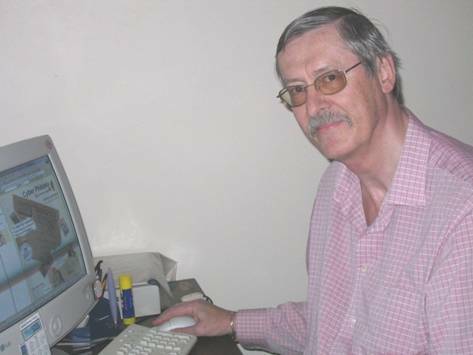 Wobbe has written numerous articles on Cyber Philately which have been published in philatelic magazines in South Africa, the Netherlands and many other countries. Currently he's working on an extended series of articles called Cyber Heroes of the past which consists of philatelically illustrated biographies of people involved in the development of the computer. These monographs have also been published on this website. At the end of 2016 his health took a turn for the worse and by early 2017, Wobbe laid down all functions in organized philately. Further enhancements to this site will be minimal, if any.